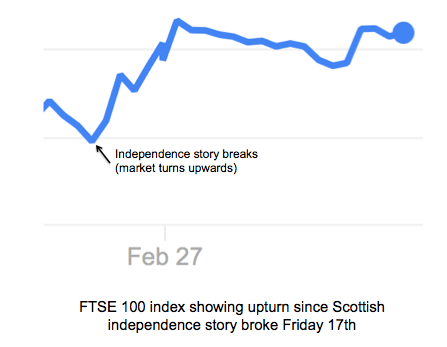 Following the news on Friday that Theresa May is preparing for The Scottish Government to demand a second independence referendum after Article 50 is triggered in March, the FTSE 100 index rose 28 points or 0.4%. This boost to the FTSE index was helped by a weaker pound as FTSE 100 members gain around three-quarters of their earnings from overseas markets. Many newspapers and online media linked the 0.3% fall in the value of Sterling against the dollar to a report in The Times claiming the UK government was preparing for Scottish First Minister Nicola Sturgeon’s demand for a new independence referendum. As is clearly demonstrated by the rise in FTSE 100 stocks, a weaker pound has upsides and in the long run a weaker pound helps exports as other countries can buy more British goods for the same money. Strong and weak as currency descriptions are fine for economists, who understand that one is not necessarily better than the other, it all depends on a nations export / import strategy. It would be better to say that if the pound falls it has moved in favour of exporters and if it rises it has moved in favour of importers. Not fully understanding either that a falling pound may have long term upsides (more jobs and exports) as well as a down side (inflation), some in the media have stated that fears over Scottish independence had crashed its value. 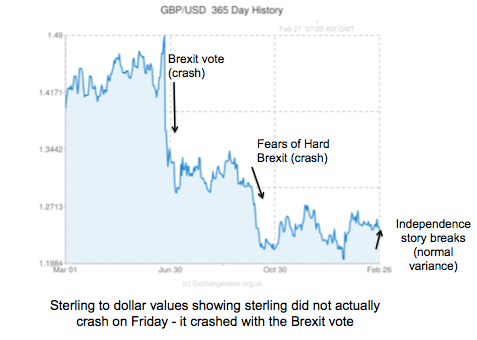 This however, is not really backed up by the facts – yesterday’s fall of 0.3% may or may not have had any link to the Scottish referendum news, its hard to tell as 0.3% is well within the normal variance of Sterling since the Brexit vote. Sterling has however fallen 16% since the UK voted to leave the EU, and Deutsche Bank are predicting a further 16 per cent fall post-Brexit negotiations for Sterling, driving the pound down to parity with the Euro, and almost parity with the dollar. Now that is an actual crash and should lead to around 10% inflation in prices by 2020. If the announcement of another Scottish independence referendum does lower the pound then it could arguably be beneficial to Scottish business overall, by boosting our exports. The market would fear Scotland’s oil and positive balance of trade leaving the pound, and indicate the strength of the Scottish economy. A lowering of the value of a currency tends to have relatively short term effect on imports/exports. The UK has devalued the Pound four times since the 1930’s (1931, 1949, 1967 & 1992 when UK left ERM). Of course there have also been periods where the currency increased in value. Yet the overall effect can be seen by looking at the ‘UK current account’, which has been negative and declining since the 1980’s. No signs of sustainable economic improvement, just short term booms and busts. Countries whose currencies have strengthened have often been able to offset this negative export factor by increasing their productivity, not always in terms of quantity but also quality. So while a weaker currency does and has helped jumpstart economies, if successful, sooner or later continued success will come to depend more on increasing productivity and therefore increasing productive investment. It is in this regard that the UK has failed so miserably for so long and continues to do so. With investments in renewable technology and probably other key areas too, Scotland has shown a more progressive and dynamic approach to productive investment. 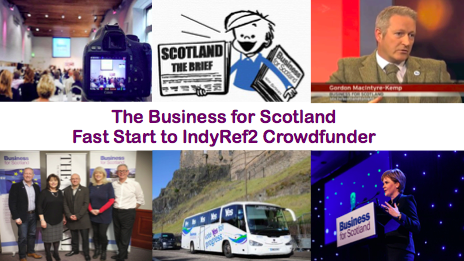 The continuation of this is central to removing Scotland from the mire into which the UK’s short termism and financialisation has dragged it into. Just don’t expect a weaker currency to be a long term panacea. Productivity and productive investment is the more important factor in that respect. But that will simply not happen if Scotland remains in the UK.